Frédérique Lambert won the women's open division at the Great Balls of Fire tournament down in Miami, as she defeated Susana Acosta, 15-12, 15-8, in the final. In the semi-finals, Lambert beat fellow Canadian Brigitte Richard, 15-4, 15-3, while Acosta beat another Canadian Christine Richardson, 15-4, 15-3. Javier Moreno's upset of Ben Croft - the International Racquetball Tour's (IRT's) #3 player - was remarkable not simply for the outcome, but it was also the second highest scoring match this IRT season. The total points was 103 with Moreno winning 15-13, 11-9, 10-12, 3-11, 11-8. It was another example of the losing player having more points than the winner, as Croft scored 53 points to Moreno's 50. Three other centuries have been played this season: Alvaro Beltran and Jack Huczek scored 100 at Kansas City Pro-Am, with Beltran winning, Jansen Allen and Danny Lavely scored 101 at the US Open (Allen won), and the most points scored in a match was 108 by Marco Mijares and Jeremy McGlothin, which also occurred at the US Open, when Mijares won. Paola Longoria defeated Rhonda Rajsich to win the Women's Professional Racquetball Organization (WPRO) Great Balls of Fire tournament in Miami, Florida, 11-9, 4-11, 11-5, 7-11, 12-10. 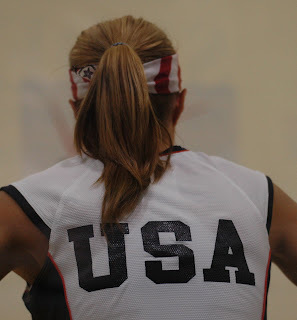 The win solidifies Longoria's place as the #1 women's racquetball player in the world. The final was one of those unusual matches where the winning player had fewer points overall than the winner, as Longoria had 45 points to Rajsich's 46. In fact, it was the third time that happened in Miami, as Jennifer Saunders had one fewer point than Cristina Amaya (43 to 44) and Nancy Enriquez had three few points than Samantha Salas Solis (42 to 45). Both those matches were in the Round of 16. There will be two WPRO events in March. The 2011 SCS Title and Escrow Pro-Am goes March 18-20 in Herndon, Virginia followed by the Terrapin Shootout - a satellite event - March 25-27 in Laurel, Maryland. Kane Waselenchuk won the San Diego Open, the latest International Racquetball Tour (IRT) event, Sunday with a five game victory over Rocky Carson in the final, winning 11-9, 7-11, 7-11, 11-0, 12-10. Waselenchuk has now won every final that he's played going back to January 2009. It was the second consecutive final that Carson was able to push Waselenchuk to five games. Prior to that Waselenchuk hadn't played a five game match all season. Being down a game wasn't a new experience for Waselenchuk, who had dropped the first game of matches to Ben Croft, Jack Huczek, Alvaro Beltran and Carson earlier in the season. But Waselenchuk hadn't lost two games in a row, as he did Sunday. But Waselenchuk responded as a #1 player should, blanking Carson in game four and pulling out a close game five to remain unbeaten in 25 months. The next IRT Tier 1 event will be the Florida Spring Break Pro/Am in Tampa, Florida March 10-13. Rocky Carson has reached the final of the International Racquetball Tour's (IRT's) San Diego Open with a gutsy performance against Shane Vanderson in the semi-finals. Vanderson had the advantage all match, winning games one and three, and in the tie-breaker Vanderson was up 9-3. Yet Carson found a way to win, taking the match in five games, 7-11, 11-6, 7-11, 12-10, 11-9. Carson will play top seed Kane Waselenchuk, who defeated 4th seed Jack Huczek in three straight games, 11-2, 11-4, 11-1, in the other semi final. That semi-final and the final are available at the IRT Network. Rocky Carson d. Shane Vanderson, 7-11, 11-6, 7-11, 12-10, 11-9. Paola Longoria and Rhonda Rajsich - the #1 and #2 Women's Professional Racquetball Organization (WPRO) players will renew their rivalry Sunday in the final of the Great Balls of Fire tournament in Miami, Florida, as they won their semi-final matches on Saturday. Thirteenth seed Nancy Enriquez's good run in Miami came to an end, as Longoria defeated her 11-3, 11-4, 11-7. Rajsich beat 3rd seed Cheryl Gudinas, 11-3, 11-8, 11-5, in the other semi-final. The finals are at noon EST on Sunday. Three of the four top seeds are in the semi-finals at the International Racquetball Tour's (IRT's) San Diego Open, including top seed Kane Waselenchuk, who beat Jose Rojas in quarter finals, 11-3, 11-4, 11-4, and 2nd seed Rocky Carson, a winner over Andy Hawthorne, 11-5, 11-6, 11-0. But 3rd seed Ben Croft lost in the Round of 16 to Javier Moreno, the veteran Mexican left-hander, 15-13, 11-9, 10-12, 3-11, 11-8. But Moreno lost in the quarters to Shane Vanderson, 11-9, 5-11, 6-11, 11-4, 11-5. Vanderson will play Carson in one semi-final, while Waselenchuk will play Jack Huczek in the other. 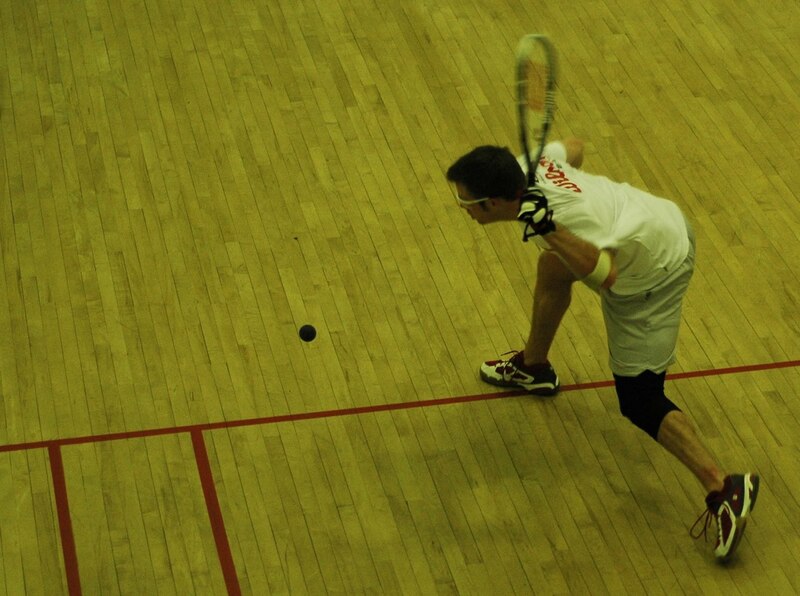 Huczek defeated Chris Crowther in three straight games, 11-5, 11-3, 12-10, in the quarter finals. The semi-finals go at 4 PM and 5 PM PST Saturday afternoon and you can see the matches on the IRT Network. The Women's Professional Racquetball Organization (WPRO) Great Balls of Fire tournament in Miami, Florida has divided into a Latinos and Anglos event after the Round of 16 results, as the four remaining Latin players are on the top of the draw and the four remaining players on the bottom of the draw are Anglos. It was on the top of the draw where the upsets happened and they all went five games. Thirteenth seed Nancy Enriquez defeated 4th seed and fellow Mexican Samantha Salas Solis, 4-11, 4-11, 12-10, 11-6, 11-7, while 12th seed Angela Grisar beat 5th seed Kerri Wachtel, 7-11, 4-11, 11-8, 11-4, 11-9. Also in the 8-9 game, 9th seed Susana Acosta beat 8th seed Krystal Csuk, 11-3, 11-3, 11-13, 10-12, 11-3. Acosta will now play top seed Paola Longoria, who defeated Frédérique Lambert, 11-2, 11-0, 11-8. The bottom of the draw went according to form, as the higher seeds all won, including 2nd seed Rhonda Rajsich, who beat Da'monique Davis, 11-4, 11-9, 12-10 and 3rd seed Cheryl Gudinas, who was a winner over Jocelyn Loredo, 11-3, 11-8, 11-5. The quarter finals will be played Saturday morning with the semi-finals in the late afternoon and final on Sunday. The results from the first round of the Great Balls of Fire tournament in Miami, Florida - a Women's Professional Racquetball Organization (WPRO) tournament - are in and there are a couple of minor upsets. Nineteenth seed Jocelyn Loredo defeated veteran Anita Maldonado, the 14th seed, 11-6, 11-7, 11-4, and in the 16-17 game, the 17th ranked Frédérique Lambert beat 16th ranked Laura Brandt, 11-8, 11-1, 11-4. The other first round matches went to the higher seeded players as Angela Grisar beat Christine Richardson, 11-1, 11-5, 11-7, Nancy Enriquez defeated Brigitte Richard, 11-3, 11-2 11-2, and Da'monique Davis beat Brandi Jacobson Prentice, 11-7, 11-7, 11-4. The Round of 16 will be played later on Friday with the quarter finals and semi-finals to go on Saturday. Daniel De La Rosa was the biggest upset winner from Thursday's qualifying rounds at the San Diego Open on the International Racquetball Tour (IRT). De La Rosa knocked off Charlie Pratt, the 11th ranked IRT player. We'd love to tell you the scores, but most of the scores from qualifying are unavailable at source. The other players of note - Javier Moreno, Polo Gutierrez, and Hiroshi Shimizu - all won on Thursday and are now in the Round of 16. Gutierrez will likely give Chris Crowther all he can handle when they meet Friday afternoon. De La Rosa will play Jose Rojas in the 16s, while Shimizu has the unenviable task of trying to defeat IRT #1 Kane Waselenchuk. You can follow the action live at the IRT Network beginning Friday at 11:30 AM PST, as that's when the first Round of 16 matches start. First up will be 2nd seed Rocky Carson versus Tony Carson and 7th seed Andy Hawthorne versus Juan Herrera. The International Racquetball Tour (IRT) closes out February in San Diego, California. It's the second tournament they've had in San Diego this season following the San Diego Racquet House event back in September-October. That was won by Kane Waselenchuk, and given that he hasn't lost on court since January 2009, you'd have to like his chances to win San Diego again. The other main players are all there - IRT #2 seed Rocky Carson, #3 Ben Croft and #4 Jack Huczek, but with the retirement of Mitch Williams, Andy Hawthorne and Jose Rojas don't have to fight it out for the 8th spot in the draw, as they are both in the top 8 now. Qualifying players of note are Mexicans Javier Moreno and Polo Gutierrez, Hiroshi Shimizu of Japan, as well as Charlie Pratt, who now the highest ranked player of those in qualifying. The IRT Network should begin web-casting the San Diego Open matches beginning Friday at 11:30 AM PST, as that's when the first Round of 16 matches are scheduled for. Those will be the bottom two matches in the draw involving 2nd seed Carson in one and 7th seed Hawthorne in the other. The draw for the Great Balls of Fire tournament in Miami, Florida has been released, and most of the top 10 Women's Professional Racquetball Organization (WPRO) players are in the sunshine state. Of note in this field is that of the 21 players only 9 are Americans (there are 5 Mexicans, 5 Canadians, and one Columbian and one Chilean). This could be the first time that the majority of players at a professional racquetball tournament have not been American. Six of the WPRO's top 10 (and 9 of the top 14) are American, but of those players only one is under 30 (Adrienne Fisher) and some are well over 30. We've noted this before, but if you're an American coach looking to win internationally in the coming years, you've got to be concerned about this situation. And it doesn't look like it going to get better in the near future, as there were only four girls in U18 at last year's US Junior Olympics. And in general, we think it bears asking the question "where are the women?" because the women's participation in many racquetball tournaments is low - 10-20% of the entries. Racquetball could grow considerably simply by attracting more women players. Paola Longoria remains the #1 player in the Women's Professional Racquetball Organization (WPRO) rankings, but she's less than 35 points ahead of Rhonda Rajsich. They'll have another chance to face off this weekend at the Great Balls of Fire tournament in Miami, Florida. Most of the top 10 is the same, but Krystal Csuk has moved up to 8th ahead of Jo Shattuck. In the next 10, Cristina Amaya is now 11th with T.J. Baumbaugh dropping back to 13th behind Keely Franks in 12th. Angela Grisar is up to 15th, and Nancy Enriquez is back in the top 20 at 19th. Rocky Carson won the Seattle Open - a Tier 3 event on the International Racquetball Tour (IRT) on the weekend by defeating Chris Crowther in the final, 11-5, 11-7, 11-7. Carson beat Taylor Knoth in the semi-finals, 11-3, 11-6, 11-7. Knoth was a upset winner in the quarter finals, as he defeated Charlie Pratt in five games, 11-7, 2-11, 13-11, 6-11, 11-7. In the other semi-final Crowther beat Ben Croft, 11-9, 12-10, 11-9. The Racquetball Blog staff tweeted out those results yesterday, and you can follow us via Twitter, where we're @racquetballblog. Canadian tennis player Milos Raonic lost the final of the Regions Morgan Keegan Championships on Sunday to Andy Roddick, 7-6 (7), 6-7 (11), 6-4, at The Racquet Club of Memphis, which was the host venue for the US Open Racquetball Championships for 14 years. Canadian Kane Waselenchuk won all 5 US Open Racquetball Championship finals he played at The Racquet Club and Canadian Christie Huczek (née Van Hees) won 3 US Open titles there, but it wasn't to be for Raonic. In fact, Raonic was beaten at the end by a racquetball-like shot from Roddick, who ran to his right and then dove to retrieve a nice volley from Raonic to win the match. Mike Green won the 37th Annual Keystone Classic - a Tier 4 event on the International Racquetball Tour (IRT) - by defeating Tim Landeryou of Saskatoon, 11-2, 11-1, 11-3. It was a rematch of the 2010 Canadian National Championship final, which Green won. Green drove serve very effectively making it difficult for Landeryou to retrieve serve let alone win rallies. In the semi-finals, Green defeated Ashton Duda, 11-3, 11-1, 11-8, and Landeryou beat Conrad Cole, 11-9, 11-5, 11-9. It looked like Landeryou would have a measure of revenge in the doubles final, as he and current Canadian women's champion, Jennifer Saunders, won the first game against Green and Cole. But Green and Cole took it up a notch, winning the second game and the tie-breaker, to take the match, 10-15, 15-6, 11-7. This weekend there's a IRT event in Seattle. The Seattle Open is a Tier 3 event running from February 17th to 20th. Then next weekend, February 23-27, the San Diego Open - a Tier 1 event - happens in San Diego, California. Aimee Ruiz and Jackie Paraiso made it five US Doubles Championships in a row as they won the 44th USA National Doubles Championship in Tempe, Arizona on Sunday. They soundly defeated surprise finalists Krystal Csuk and Cheryl Gudinas, 15-2, 15-1. Overall, Paraiso has now won 14 US women's doubles titles, five with Ruiz, three with Joy MacKenzie (Paraiso's sister), three with Kim Russell-Waselenchuk, two with Michelle Gould, and one with Laura Fenton. That record almost makes Ruiz's seven consecutive titles pale in comparison; Ruiz won two years with Laura Fenton prior to partnering with Paraiso for the last five. In the third place match, sisters Danielle and Michelle Key finished their impressive tournament with another win defeating 2nd seeds Rhonda Rajsich and Kim Russell-Waselenchuk, 3-15, 15-10, 11-10. For all her accomplishments in singles, Rajsich has yet to win a US doubles title. Rocky Carson and Jack Huczek became the winningest men in US Doubles history by winning their sixth US Doubles Championship Sunday, when they defeated Chris Crowther and Shane Vanderson in the final, 15-7, 5-15, 11-10. In the third place match, Andy Hawthorne and Jose Rojas beat Jansen Allen and Tony Carson, 15-11, 15-6. Two upsets happened in the first two quarter final matches at the 44th USA National Doubles Championship in Tempe, Arizona, but there was only one minor upset in the rest of the quarter finals. The larger upset happened on the men's side as 2nd seeds Jason Mannino and Eric Muller lost to 7th seed Jansen Allen and Tony Carson, 15-10, 7-15, 11-5. Allen and Carson will face Chris Crowther and Shane Vanderson. Third seeds Crowther and Vanderson had a scare as they dropped game one against Jeff Stark and Shawn Royster and were down in the middle of game two. But they managed to come back and win the second game and then took the tie-breaker by a wide margin, winning 14-15, 15-11, 11-3. In the 4th versus 5th seed match, 5th seeds Andy Hawthorne and Jose Rojas came out on top over veterans Cliff Swain and Josh Tucker, winning in two straight game, 15-13, 15-2. Top seeds Rocky Carson and Jack Huczek won their quarter final match in two straight games, defeating Anthony Herrera and John Scott, 15-4, 15-7. They face Hawthorne and Rojas in the semi-finals on Saturday. On the women's side, sisters Danielle and Michelle Key - seeded 5th - defeated 4th seeds Kristen Bellow and Janel Tisinger, winning in two straight games 15-11, 15-10. The win gives the Keys the first chance to defeated the reigning 5 time champions Aimee Ruiz and Jackie Paraiso, as that's who they'll meet in the semi-finals on Saturday. On the other side of the women's draw it will be Rhonda Rajsich and Kim Russell-Waselenchuk versus Krystal Csuk and Cheryl Gudinas in the other semi-final, as Rajsich and Russell-Waselenchuk defeated the mother-daughter team of Malia Bailey and Kelani Bailey, 15-11, 15-7, and Csuk and Gudinas beat Laura Fenton and Liz Alvarado, 15-14-15-8. Matches in the men's and women's US Team Qualifying Divisions can be seen via the IRT Network.com. Play has begun at the 44th USA National Doubles Championship in Tempe, Arizona. Some of the matches in the men's and women's US Team Qualifying Divisions can be seen via the IRT Network.com. The odds on favorite in the men's division is the team of Rocky Carson and Jack Huczek. The pair have won 5 doubles championships together, which ties them for most ever with Dan Obremski, who won four times with Doug Ganim and once with Kelvin Vantrease. The other big story in the men's competition is the absence of Ben Croft, who was one of the defending champions with Mitch Williams. However, Williams's shoulder injury and announced retirement from the International Racquetball Tour (IRT) have left Croft without his fellow champion. Thus, it seems Croft has chosen to sit this one out rather than play with someone else. Given the hectic IRT schedule Croft has had it's probably a good choice for him to rest up. Finally also curious is that the 2nd seeded team is Jason Mannino, who retired from the IRT last year to become its commissioner full time, and Eric Muller, who won two doubles titles with John Ellis in the early 1990's. In women's play, four time defending champions Aimee Ruiz and Jackie Paraiso and looking to win a fifth this weekend in Tempe. If they win, it will be a seventh straight title for Ruiz, who also won twice with Laura Fenton, and Paraiso will have taken 7 of of the last 9 titles. The last time the winning team didn't have Ruiz or Paraiso was 2001 when Cheryl Gudinas and Kim Russell won. Both Gudinas and Russell-Waselenchuk are in Tempe to try and knock off the champions. But they aren't playing together. Gudinas has teamed up with Krystal Csuk and Russell-Waselenchuk is playing with Rhonda Rajsich. Also of note is Kristen Bellow playing her first tournament since December 2009. She's partnered with Janel Tisinger. Mike Green, the current Canadian racquetball champion, defeated Vincent Gagnon on Sunday to win the Racquetball Canada National Team Selection Event in Brossard, Que. at Nautilus Plus. Green dropped the first game to Gagnon, but then came back to win the match in a tie-breaker, 10-15, 15-7, 11-4. Green, a 6 time Canadian Champion, also defeated Gagnon at last year's Canadian National Championship, so could be back at #1 in Canada, a position he held until 2009. (this pending a release of official Racquetball Canada rankings). Tim Landeryou took 3rd place by defeating Kris Odegard, 8-15, 15-12, 13-11, although there was a scary incident in the middle of game two as Odegard accidentally hit Landeryou in the head as he was swinging for the ball. Landeryou had gone down to make a shot and was just getting up as Odegard swung. It looked like there was room to swing but Odegard caught Landeryou right in the side of the head just in front of Landeryou's left ear. Landeryou went down immediately, and stayed down for some time. But after taking a few minutes of injury time he was able to continue the match with Odegard serving at 10-9. Landeryou then scored 6 of the next 8 points to force a tie-breaker and fought off a match point at 10-9 in that tie-breaker to win it 13-11. On the women's side, Frédérique Lambert upset top seed and current Canadian champion Jennifer Saunders in two straight games, 17-15, 15-10. Lambert was sharp, and Saunders couldn't quite match the younger player's shooting accuracy. Third place went to Josée Grand'Maître defeated Brandi Jacobson Prentice, 15-1, 15-4. The 8 players who finished in the top four this weekend should comprise Team Canada for the 2011 Pan American Championships in Nicaragua in April based on the combination of these current results combined with results from the National Team Selection Event in November 2010 in Edmonton, Que. and those from last year's Canadian National Championships. Former US National Singles champion Mitch Williams has announced his retirement from the International Racquetball Tour (IRT) due to his left shoulder injury. He's the reigning two time World Champion in doubles, winning last year with Ben Croft and in 2008 with Jason Thoerner. The press release on the IRT website indicated that Williams would play "a limited schedule of amateur and satellite events once his shoulder is healed." Thus, he may still play for the US in the future. In 75 IRT events, Williams reached the finals once and semi-finals three times, including twice this season. However, at last year's US Open Williams injured himself when he was diving for a ball during his quarter final match with Croft. At the time, Williams was up 9-4 in the fourth game and ahead two games to one. It looked like he was going to reach his first US Open semi. But the dive resulted in a dislocated left shoulder, and although Williams tried to continue, he wasn't able to go on. Williams played two events in January, but was not 100%. Thus, his decision to retire. Williams won the US National Singles Championship in 2007, defeating Shane Vanderson in the final and Rocky Carson in the semis. He also won the US National Doubles Championship in 2007 and 2010 both times with Croft as his partner, and was runner up in 2008 with Jason Thoerner and 2009 with Croft. Williams finished in the top 10 on the IRT in each of the last five seasons with his highest ranking being 6th at the end of both the 2006-07 and 2007-08 seasons. Originally from North Carolina but now residing in Albuquerque, New Mexico, Williams's game style was very aggressive. A left hander, he almost exclusively used drive serves and then hit the ball all out during rallies. He was sponsored by Wilson Racquet Sports and will continue to work with them doing clinics around the US. The Racquetball Blog staff always found Williams easy to talk to and enjoyed doing so. We wish him the best in his retirement and the next part of his life.